The folks who print America's money have designed a high-tech makeover of the $100 bill. It's part of an effort to stay ahead of counterfeiters as technology becomes more sophisticated and more dollars flow overseas, Federal Reserve Chairman Ben Bernanke says. The makeover, unveiled Wednesday, may leave people wondering if there is magic involved. Benjamin Franklin is still on the $100 bill, also known as C-note, but he has been joined by a disappearing Liberty Bell in an inkwell and a bright blue security ribbon composed of thousands of tiny lenses that magnify objects in mysterious ways. Move the bill and the objects move in a different direction. The government hopes the new bills will make it harder for high-tech counterfeiters to replicate. The new currency will not go into circulation until Feb. 10 of next year, giving the government time to educate the public in the United States and around the world about all the changes. "We estimate that as many as two-thirds of all $100 notes circulate outside the United States," said Bernanke, who stressed that the 6.5 billion in $100 bills now in circulation will remain legal tender. 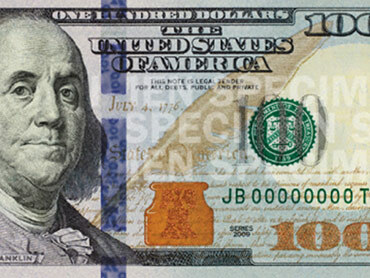 The $100 bill, the highest value denomination in general circulation, is the last bill to undergo an extensive redesign. The Bureau of Engraving and Printing began the process in 2003, adding splashes of color to spruce up first the $20 and then the $50, $10 and $5 bills. The $1 bill isn't getting a makeover. The changes are aimed at thwarting counterfeiters who are armed with ever-more sophisticated computers, scanners and color copiers. The $100 bill is the most frequent target of counterfeiters operating outside of the United States while the $20 bill is the favorite target of counterfeiters inside the country. The redesigned $100 bill had originally been expected to go into circulation in late 2008 but it's introduction was delayed to give the government time to refine all the new security features. The government has prepared education resources in 25 languages to inform the public about the design changes and is giving people a chance to view the new bills on its website. "We wanted the changes to be very obvious, visible and easy to see," Larry Felix, director of the Bureau of Engraving and Printing, said in an interview with The Associated Press. The new blue security ribbon will give a 3-D effect to the micro-images that the thousands of lenses will be magnifying. Tilt the note back and forth and you will see tiny bells on the ribbon change to 100s as they move. But that's not all. Tilt the note back and forth and the images will move side to side. Tilt the note side to side and the images will move up and down. In addition, to the left of Franklin's portrait, will be an inkwell that will change color from copper to green when the note is tilted. The movement will also make a Liberty Bell appear and disappear inside the inkwell. "As with previous U.S. currency redesigns, this note incorporates the best technology available to ensure we're staying ahead of counterfeiters," Geithner said. Franklin will remain on the front of the $100 bill and Independence Hall in Philadelphia will remain on the back of the currency although both have been modified in ways aimed at making it harder to produce counterfeit copies of the bills. "The new security features announced today come after more than a decade of research and development to protect our currency from counterfeiting," said U.S. Treasurer Rosie Rios, whose signature along with Geithner's will appear on the new currency.